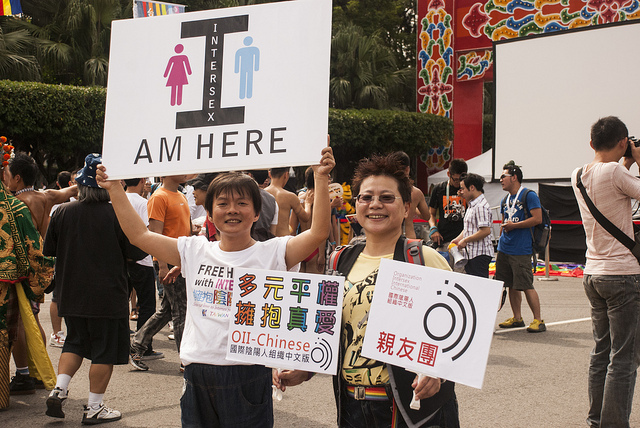 Intersex activists in Taiwan celebrate their identity. Photo: Shih-Shiuan Kao | FlickrCC. Estimates state that about 1 in 2,000 people are born intersex, though some experts claim that number is even higher. In most parts of the world, those babies undergo surgery to “correct” the issue and give them more “normal” looking genitalia. But advocates for intersex rights claim that these surgeries can cause lasting physical and psychological harm to those people, and of course they are undertaken without the patient’s consent. Many have begun using the term “intersex genital mutation” for these surgeries, in order to draw parallels to female genital mutilation, which has been outlawed in many parts of the world. Although there have been some studies seeking to determine if intersex children are better off without such surgeries, they are few and far between, and while there are numerous activists in favor of outlawing the practice, there are a number of medical professionals who think that such surgeries benefit patients. Activists claim that the surgeries are simply the product of social norms that fear ambiguous genitalia, and which impose rigid gender roles on people based upon their perceived gender. By surgically altering a baby’s genitalia, the doctor is deciding that child’s gender for them, without any input from the child in question. The U.N. seems to have come down in favor of the intersex advocates, and is calling for such surgeries to be illegal. Some advocates, as well as medical practitioners, are concerned that simply banning such procedures won’t have a positive effect, and that instead governments need to work with medical professionals to end the practice. Others fear such thinking simply privileges doctors over what’s actually best for patients.